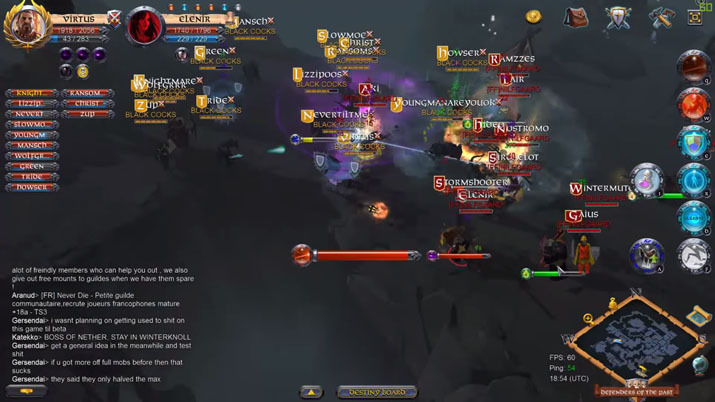 Albion Online, the brand new MMO PvP game, from the Berlin-based studio Sandbox Interactive, is portrayed as a sandbox MMO with a player-driven economy and robust PvP. However, it falls short on both its promise and entertainment value. With thousands of players online simultaneously, a huge landmass to explore, and plenty of room for Guild vs Guild combat, Albion Online has potential to be an outstanding experience. You get thrown into the game with a basic introduction, building weapons and tools out of stone and logs. Pay attention to this part of the game: the essential nature of crafting is taught here, and you become quite familiar with this mechanic as time goes on. Leveling up is determined by what items, armor, and weapons you use, craft, or gather. Sword, spear, shield, plate helmet, and leather boots are all separate trees you level up over time, and you do so by killing certain amounts of enemies at your tier level. The game is divided by tiers, each tier offering new abilities and damage ratios. This process is neither interesting nor thought-provoking, and is pretty straightforward. Creating a variety character is possible, perhaps having some pieces of leather that give you stealth, and pieces of plate that give you healing bonuses. One could imagine creative mixing of these abilities, but since this is basically all there is to a character, it seems shallow and uninteresting. The crafting system is also pretty simple and based on the same tier and leveling-up principles as combat skills. For each item you make, you become better at making that particular item. In order to get the parts for these recipes, you have to harvest them from the world or buy them from the market. It’s basically a very large grind with little tangible rewards for quite awhile. Most tiered armor can be bought off market for cheap since grinding causes saturation in player-driven markets. When you die, you lose a certain percentage of the silver you have. You can turn your silver into Gold by buying it off the gold market. Once you have gold, your money is mostly secure. The price of gold goes up or down based off how many players are using the market. I bought a bunch of gold for less than a hundred silver when it came out, now gold has gone up to around two hundred at time of writing. If I were to sell the gold, I’d get all that back in silver. The market is quasi-player driven. Whenever a creature dies, or an item is harvested, if there are no buy orders for that item, or if they are low buy orders, the NPC market will create buy orders to sell to. These are usurped by player buy orders generally, but it does create a slight safety net for items bottoming out on a set price. Albion Online comes with a shelf price and no subscription is required to play. However, if you do subscribe, you get skill gains and harvesting gains, and probably other stuff too. You can also buy subscription time with in-game Gold, or perhaps buy some gold with real life money to get some spending cash in game. Unfortunately, this seems to be the trend for MMOs these days. Albion Online would like to see itself as a great PvP game, with exciting battles, and guild conflicts, and all that. There are three different types of zones where PvP can occur: Yellow, Red, and Black. Each zone has areas where PvP is open and anyone can attack anyone. Other than this, there are certain rules for each zone, with the freedom and penalties getting more severe once you reach Red and Black. In yellow zone PvP, you can be knocked out but not looted nor killed. In Red, you can get killed and full loot. Black zones, when you die you must respawn, and have no option to wait for a respawn timer like in the other zones. While players can flag themselves for PvP, the open PvP being dedicated to small areas on the map takes a lot of the thrill out of Open World PvP; with much of the danger lessened, so, too, is the dramatic sense of adventure. Albion Online would like to be a great game — maybe it will be. As it stands, this PvP Sandbox MMO feels like a diluted World of Warcraft mixed with Eve Online to make for a couple of hours of neat fun. There wasn’t much temptation to come back for more, nothing really hitting home or special; rather, it felt like another cookie-cutter MMO attempt to get as much money from microtransactions as possible. I’d only recommend this game if you enjoy grinding-based games that reward lush bank accounts, or if you relish tremendous amounts of repetitive tasks.